We developed and managed a social media strategy to deepen engagement with key audiences. 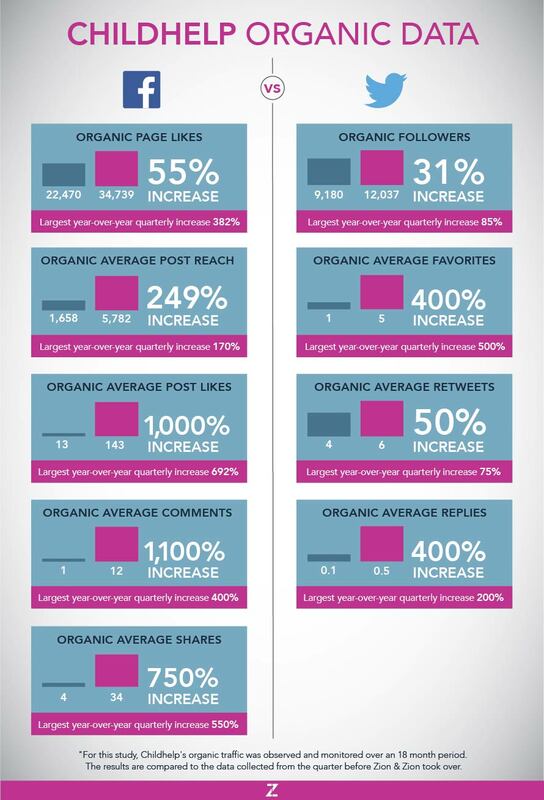 As a result, Organic Page Likes increased 55%, Organic Followers increased 31%, Organic Average Post Reach increased 249%, Organic Average Replies increased 400%, and Organic Average Post Likes increased 1,000%. 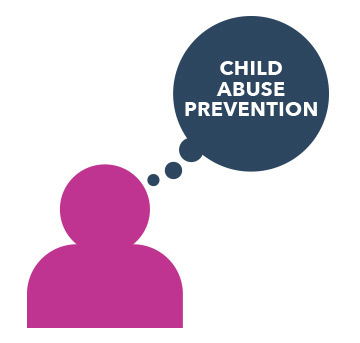 Childhelp is the nation’s oldest and largest non-governmental child abuse prevention organization. For nearly six decades, founders Sara O’Meara and Yvonne Fedderson have built an effective organization with the assistance of volunteers, trained staff, elected officials representing local and national government, celebrity ambassadors, and many others. Childhelp currently administers programs in all 50 states with physical extensions in 13 states. Childhelp engaged Zion & Zion as its communications agency of record focusing on strategic position, messaging, campaign development, public relations, and social media. In the last few years, the major social media platforms have evolved their platforms to ensure that brands are forced to pay to advertise in order to experience any real success. Despite this ever-changing and restrictive environment, our social media efforts for Childhelp are an exemplar of success when it comes to purely organic social media efforts. How were we able to accomplish this? Let’s start at the beginning. After carrying out our own research which included leveraging Childhelp’s donor database, our insight was that Childhelp was currently relying on an aging demographic for financial support. We realized that if engagement with millennials did not begin soon, Childhelp’s financial support would begin to wane over time. We developed an overall strategy to appeal to a younger generation of potential volunteers, donors, and celebrity ambassadors, and Childhelp’s social media presence was going to have to be addressed as part of this plan. Celebrity and political influencers and advocates. In order to fine tune the implementation of our social media campaigns over time, and to measure the overall success of our efforts, each quarter our team engaged in regular monitoring, reporting, and refinement. In social media, ROI is famously difficult to prove, so our goal was to keep our measurement tactics clear and consistent, to ensure both integrity and accuracy. Comprehensive in nature, the numbers in these reports were laid out in multiple ways to accommodate various ways of thinking and potential approaches to the numbers. The data included quarterly differences, year-over-year comparisons, and cumulative totals. The results speak for themselves. We were able to better position Childhelp as the leader and expert on all issues related to child abuse, and in doing so, we elevated Childhelp’s brand across key social platforms by leveraging the client’s assets, maximizing news coverage, and cross-promoting with influencers, all of which earned Childhelp the eyes, hearts, and minds of a larger, younger, and more engaged audience.